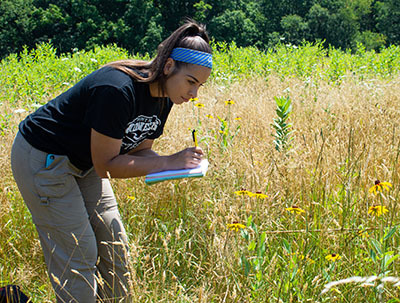 "The variety of classes and discussion around real-life application of knowledge has taught Paula how to critically evaluate a problem at Audubon Greenway Conservation Area and find the best solution. Her ability to multitask and bounce from one topic to another implies that her classes have kept her on her toes and forced her to use all available resources to complete the job above satisfactory standards." 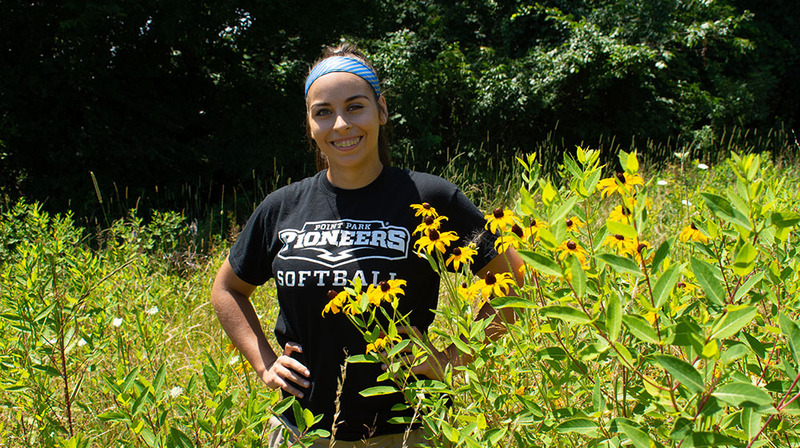 "The work that I am doing as a Point Park intern for Allegheny Land Trust has grown my appreciation for the environment and opened my eyes to how important it is to do everything in our power to help preserve our Earth." How did you land a summer internship with Allegheny Land Trust? My Point Park University softball teammate, Kim Corcoran, mentioned that her ecology professor, Dr. Matthew Opdyke, was telling students about an available biology internship. She sent me the advertisement for the internship and I was immediately interested. I thought this internship would be a great way to jumpstart my science career. My concentration in the biological sciences program is cellular/molecular. However, I always had thoughts of expanding and pursuing a double concentration in environmental science, so this was a perfect opportunity for me to explore that. I emailed Professor Opdyke and told him that I was interested in the position and we set up an interview. The interview went well, and I was scheduled to start working the next month. I was very excited that I got the position since it would be my first internship ever and new doors would open for me. I am very fortunate to have connections through Point Park University and a strong academic resume that helped me land this joint internship with Allegheny Land Trust. Tell us about the type of work you are doing. With this internship, I’ve learned how to conduct different environmental surveys. One of the bigger surveys I do are called pollinator surveys for Project Bee Watch. Project Bee Watch uses citizen science volunteers and researchers like Professor Opdyke and me in order to track the activity, type and amount of pollinators that populate a specific area. This is done by using 1 meter x 1 meter plots to survey and track the pollinators and wildflowers in that specific area. Allegheny Land Trust’s Audubon Greenway was the greenspace that was chosen for the project’s first year since it has acres of meadow fields, a perfect habitat for wildflowers and pollinators. With the help of the volunteers, Professor Opdyke and I hope to calculate baseline data from this first year's project so it can then be used for reference for future Project Bee watch results. It is a really heart-warming feeling being a part of this project to bring awareness to the public about pollinators and their global decline. The data and results of the first Project Bee Watch will be displayed at our Pollinator Festival on July 28 from 10 a.m. to 1 p.m. at Audubon Greenway. Along with conducting bee surveys at Audubon Greenway, I also monitor the greenspace itself for Allegheny Land Trust. I plant flowers, monitor trails and the fields, and assist with certain projects for the area. Also, I attend events to represent Allegheny Land Trust, advertise for events and assist with land management. In this internship, I also assist Professor Opdyke with lichen and wetland plant surveys. We conduct the wet land plant surveys at another location in Allegheny County called Wingfield Pines, which is also owned by Allegheny Land Trust. Professor Opdyke has been performing these surveys for several years in order to accumulate data and to interpret their results and impact in Allegheny County. The work that I am doing as a Point Park intern for Allegheny Land Trust has grown my appreciation for the environment and opened my eyes to how important it is to do everything in our power to help preserve our Earth. How have your Point Park biology classes helped you with this internship? My Point Park biology classes have helped me a lot with this internship. This internship requires a lot of background knowledge for basic data collecting skills that I have already gained from my lab experience at Point Park. When it comes to research and science, you have to be very detail oriented and as accurate as possible. I have obtained these skills from repetition in my biology classes. Also, I believe that since I retained most of the material I learned in my general biology classes, I felt more confident going into this internship. I never was completely lost learning about different species of trees, insects, grasses, lichens, etc. It was very interesting to put my prior knowledge to the test with this internship and to see what I remembered from my general biology classes. This experience has really helped me realize that what we learn in those general classes are important to know. I chose Point Park because I like to have close connections with my peers and professors and since Point Park is a smaller school, it is easier for me to make those types of connections. I really enjoy how personable the whole experience is and that I can receive the one-on-one guidance I need in order to be a successful student here and in my future career. The faculty and staff at Point Park have been very helpful with any assistance that I’ve needed. Since I'm a student athlete, scheduling can be stressful, especially with labs, but my advisors and professors have always worked with me. I’ve never had a problem making up labs or scheduling due to my hectic schedule with softball. It is really nice knowing I can reach my full potential being the best student I can be while also being a student athlete here at Point Park. Additionally, the location of Point Park is very intriguing. There are so many opportunities in the City of Pittsburgh that students can pursue to jumpstart their careers. The location and the amount of companies that surround the campus alone is overwhelming, but in a good way. Connections are a huge stepping stone into the career world and Point Park offers that in the best way. What are looking forward to most when you return to campus in the fall? I am looking forward to going more into depth into my science classes this upcoming semester. Since I will be a junior, my workload is going to be heavily science and biology related. Point Park offers specific classes that are tailored for each concentration so you know exactly what you will be studying during your four years here. I’ve always had a love for science ever since I was in middle school and I have a very curious personality so I really enjoy learning new things. It will also be interesting to see how my internship relates to my upcoming ecology courses. Knowing that I’m going to be learning new material that will push me forward into the career I want to be in is very exciting. "This is the first joint internship between Point Park University and Allegheny Land Trust that focuses on biological conservation. Paula showed enthusiasm for getting into the field to assist with research relating to pollinators and land stewardship duties. It was also clear from her interview that she would be a significant help in communicating and educating volunteers in Project Bee Watch.